Photo taken from a slide---I think this is a better version than what I have posted before. Besides, how often did John wear orange? Hi Sara, I think I have a better copy of that photo somewhere. Will look for it. 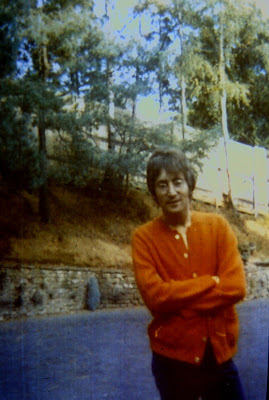 I have photos of John wearing orange, check in my book. Also, the scarf I knitted for him and he wore at least twice was orange (also, both photos in my book). Hi there! Great pic. Any idea the year?? A friend guessed fall of 1971, possibly?